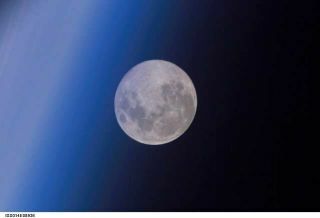 This view of a full moon was photographed by an Expedition 14 crewmember onboard the International Space Station. Earth's horizon and airglow is visible at left. As the full moon rises this Wednesday evening, June 18, many people will be fooled into thinking it's unusually large. The moon illusion, as it's known, is a trick in our minds that makes the moon seem bigger when it's near the horizon. The effect is most pronounced at full moon. Many people swear it's real, suggesting that perhaps Earth's atmosphere magnifies the moon. But it really is all in our minds. The moon is not bigger at the horizon than when overhead. The illusion will be particularly noticeable at this "solstice moon," coming just two days before summer starts in the Northern Hemisphere. The reason, according to NASA, lies in lunar mechanics: The sun and full moon are like kids on a see-saw; when one is high, the other is low. This week's high solstice sun gives us a low, horizon-hugging moon and a strong, long-lasting version of the illusion. If it's any consolation, space station astronauts report the same effect. Here's how it works: Your mind believes things on the horizon are farther away than things overhead, because you are used to seeing clouds just a few miles above, but the clouds on the horizon can indeed be hundreds of miles away. So if we think something (such as the moon) is farther away, and it's not, then it seems larger. If you remain doubtful, test the idea yourself. Go out at moonrise with a small object, perhaps a pencil eraser. Hold it at arm's length as the moon rises and compare the sizes of the moon and the eraser, then repeat the experiment an hour or two later when the moon is high in the sky. A rolled up tube of paper works well, too. Moonrise times vary by location. On Wednesday, it will come up at these local times at these locations, according to NASA: New York City, 8:58 p.m.; Miami, 8:35 p.m.; Seattle, 9:51 p.m. The moon rises about 50 minutes earlier Tuesday night, when the effect will also be noticeable because the moon will be nearly full. Oh, and that raises another fallacy: There's no such thing as a full moon. Additional moonrise times for your location are available from the U.S. Naval Observatory Web site.